With Mother’s Day right around the corner, some families may be scrambling to secure brunch plans and flower arrangements. Others may not even know what to do for Mom; it’s a tall order to figure out how to best honor someone who gives so much. Chick-fil-A asked hundreds of moms across the country how they’d like to spend their big day, and their answers may surprise you. That’s because the majority of moms don’t expect — or even want — grand gestures. Some mothers report that they’d simply love to have a moment (or several) of peace. Ronda Sexton Ogilvie is another mother who wants peace on the home front. But more than anything, she wants everyone to have a good time. Mothers, after all, tend to want to see the family they helped create flourish in their own environment. Ogilvie is certainly not alone in craving the simple things. In fact, the vast majority of women we polled wanted access to surprisingly basic comforts. Coffee in bed? Check. Not having to cook or clean? Check. A nap? Yes, that too. As many moms as there are who just want a relaxing day, there are even more who value homemade crafts from the heart — sticky spots, fingerprints and all. Kid-made crafts that make mom happy range from flowers planted in a hand-painted pot to frozen pop stick frames bearing family photos. Many moms said they’d love to unwrap anything stamped with their ones’ little handprints, perhaps because it’s a way to remember how small they once were, even when they’re all grown up. Kelley Blackwell Wilson was one of several moms who said handprints make a gift extra special. “One year, my husband took my son to pottery painting and made me a coffee mug with his handprints on it,” she says. Kelley was full of crafty ideas for little ones. “Give the kids a canvas and paint, and you might be amazed at the new artwork for your home,” she shared. She also advised, as did several other moms, planting an herb garden for the moms who love to cook. Yard projects require adult supervision, but there are others that are far easier for little hands to execute on their own. Crafty kids’ company and Chick-fil-A Kids Meal partner Artzooka! makes colorful sets containing almost everything kids need to create artful additions to home décor. The company designs arts and crafts play patterns for ages five and up, all based on the Artzooka! TV series for school-age kids. Craft kits include Button Mosaics, which kids can use to make button-based wall art. Cupcake Creations kits let kids turn cupcake tin liners into animals. Cupcake liners are surprisingly conducive to decorative art, even without the kit. 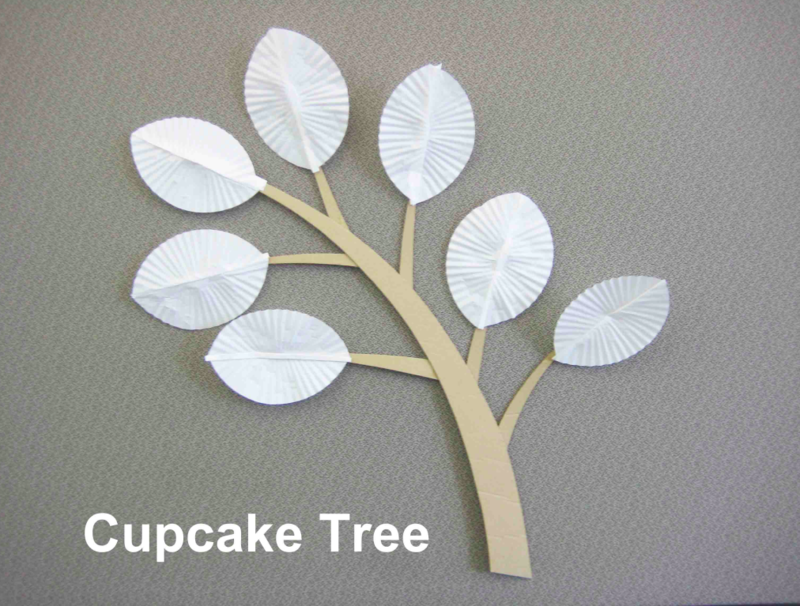 Try making the Cupcake Tree pictured here, which requires only a piece of cardboard cut (safely) into a tree branch shape, cupcake holders folded to look like leaves and a little craft glue. Trees look lovely as wall art, or even placed in a vase. Cupcake liners also make beautiful flower bouquets, which are likely to outlast roses. No time for making a coupon book? Good news procrastinators — some mothers report they’d be happy with a gift that requires almost no effort at all: hearing their kids’ voices. Mimi Baker, whose oldest child is in graduate school and second daughter is on a yearlong mission trip, simply hopes everyone can get on the same page and schedule a conversation, as face to face as they can manage. “I would really like to talk to them via Skype because I miss seeing their faces,” she says.